Ethnic food and travel literature blog. A number of ripe avacados that suits the size of the crowd you are cooking for. Now, if you still prefer chopping the tomatoes and onions by hand, go for it. But this really speeds things up. Just mash up the ripe avacados, and add amounts of the remaining ingredients to fit the size of the batch you are making. Serve with some super cheap restaurant style tortilla chips from your local box warehouse store and bring on the beer and margaritas! 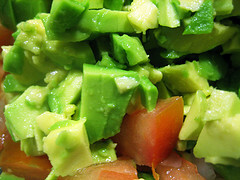 Writer’s Note: Guacamole is a great recipe to serve at summer gatherings. Some other ideas for summer suitable food include these lists of pineapple recipes, summer cocktails, ideas for backyard barbecues and simple menus for summer. Also, for those transitioning to a more plant-based diet and trying to cut down on dairy, it makes a great replacement for sour cream on burgers, wraps and Mexican meals. Here’s a link some ideas for vegan sandwiches to get you started.